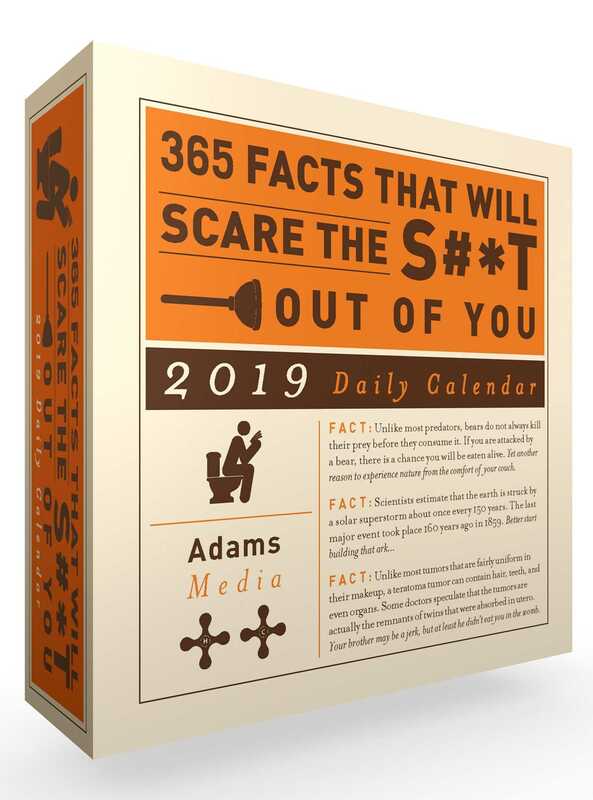 It's a page-a-day of WTFs with the 2019 edition of the bestselling 365 Facts That Will Scare the S#*t Out of You calendar—complete with brand-new horrifyingly humorous entries. You may think you’ve seen it all when it comes to disturbing phenomena, but you haven’t seen anything yet! 365 Facts That Will Scare the S#*t Out of You Daily Calendar 2019 Daily Calendar is packed with hundreds of new and unnerving facts that will sicken and terrify even the toughest crowd. From a brain-eating parasite that causes death in as few as seven days to the traditional Alaskan delicacy of mashed, fermented salmon heads, this gut-churning calendar is guaranteed to make you squirm every day of the year!